Spend the 20th (Wed) exploring nature at Finke Gorge National Park. And it doesn't end there: take in the local highlights with Walking tours, identify plant and animal life at Alice Springs Reptile Centre, steep yourself in history at Alice Springs Telegraph Station Historical Reserve, and get great views at Anzac Hill. To find maps, reviews, traveler tips, and tourist information, use the Alice Springs journey planner . Melbourne to Alice Springs is an approximately 5-hour flight. You can also drive; or take a bus. Expect somewhat warmer temperatures when traveling from Melbourne in March; daily highs in Alice Springs reach 40°C and lows reach 21°C. Cap off your sightseeing on the 20th (Wed) early enough to travel to Darwin. Spend the 21st (Thu) wandering through the wild on a nature and wildlife tour. 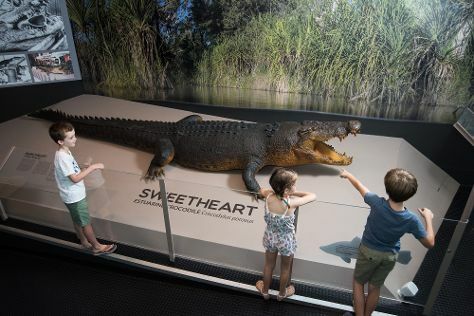 There's still lots to do: see the interesting displays at Defence of Darwin Experience, brush up on your military savvy at Darwin Aviation Museum, see the world from above with a helicopter tour, and make a splash at Wave Lagoon. To see other places to visit, photos, ratings, and more tourist information, use the Darwin travel itinerary planner . Traveling by flight from Alice Springs to Darwin takes 5.5 hours. Alternatively, you can drive; or take a bus. Plan for a bit warmer nights when traveling from Alice Springs in March since evenings lows in Darwin dip to 28°C. Finish up your sightseeing early on the 24th (Sun) so you can travel back home.